The following is information on how to properly care for your new puppy in their first few weeks. These are guidelines and practices that we have used over the years, and have found to be the most helpful in ensuring a healthy and happy puppy. DISCLAIMER: All information on this site is presented solely for educational and informational purposes and should not, at any time, be considered a substitute for seeking or receiving veterinary care for your pet. It is important to treat your new puppy much as you would a new baby for the first couple of weeks. By this, I mean you should closely observe their behavior, eating habits, monitor their activity level, and observe their feces as well. Any signs of lethargy, not eating, diarrhea, or vomiting should be addressed IMMEDIATELY. Do not wait a day or two to see if the puppy starts to "feel" better. What starts out as a little diarrhea or lack of eating, can stress your puppy quickly and suppress their immune system, which, in turn, CAN CAUSE THE PUPPY TO BECOME VERY ILL. Prevention is the key to a healthy puppy! Address any issues immediately, either at home, or if you do not feel equipped to handle it at home, then take them to a veterinarian experienced with small dogs. When choosing a veterinarian for your new puppy, please be aware that all veterinarians do not specialize in small breed dogs. Many veterinarians will specialize in a certain field, much as doctors and physicians do, so please make sure your veterinarian has extensive experience treating and working with small dog breeds. All our puppies are kept to a minimum of 10 weeks, and up to 16+ weeks of age before they are able to go home with buyer. We do this in order to maintain high quality pets, that are healthy and ready for new environments. Our puppies use "Puppy Doors" from 3 weeks of age, so they are accustom to going outdoors/indoors via puppy door. They are also up to date on all shots prior to you taking your pet(s) home from us. We register our litters through CKC (Continental Kennel Club). We appreciate your interest and further questions, you may reach us via email, phone call or text message through provided contact info. Visitation of Puppy/Puppies at YorkieRanch? We understand the level of excitement when you are choosing your puppy or have already made the commitment to one of our puppies. We have a strict policy in place that we absolutely will not show puppies until after they have had their first shot and are weaned from nursing. 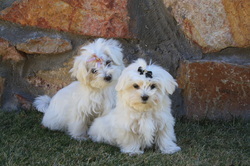 This typically occurs at the 6 week mark for our standard size puppies and 7-8 week mark for our teacups. This is not to be rude, this is to keep any additional stress from overhandling to a minimum and also to keep germs and harmful disease/illness exposure at bay. We are extremely cautious about minimizing germs/bacteria/disease while the puppies are at YorkieRanch, especially during the most critical time prior to having their first shot done. We stress this to keep the healthiest environment for the puppies until their immune systems have a better chance to develop. Also, we wean gradually so we don't stress the puppy out by pulling away from momma suddenly. We also work and have full family lives, so we try to accommodate but cannot always be available on certain days. We try to keep you updated through photos and videos as the puppy develops and changes over the week until he/she is old enough to go home. We highly advise you use a chest harness instead of a plain style dog collar. This helps protect your puppy and small pooch against injury of the Trachea. You may place a regular style collar for purposes of Tags for Vet and Ownership. When to Socialize Puppy or Take to Groomer? We highly suggest that you keep your new puppy safe from illness and various dog diseases/illnesses by keeping them away from Dog Parks and other high canine traffic areas until the puppy has had their entire first series of shots. This includes going to the groomer. Also, it's normal for people to want to touch and hold your new puppy when you take him/her out to public areas. Just be cautious with this, ask people to wash their hands if you allow them to touch. This is how we protect our brand new babies when we go out shopping and such, the same advice is safe when it comes to new puppies too. You want their immune systems to be strong and developed before exposing them to too much. Again, this is our opinion based on many years of experience. Traveling Home With Your New Puppy from Pick Up? It's tempting to stop on the side of the road or a parking area on the way home if you come from far away. Please, DO NOT allow your new puppy to roam free for a "Potty Break"! This is extremely dangerous. Have your dog on a leash with PROPERLY FITTING harness to avoid the dog/puppy from running away or into traffic. Keep in mind, you are new to the puppy, and the area is not familiar to the puppy, so you run the risk of the puppy/dog to run away due to fear. ***It is a good idea to bring along a towel, blanket, small travel crate/kennel, potty pads, etc for the trip. Some puppies experience car sickness on trips, so be prepared just in case. ​ Bringing home a new puppy is extremely exciting. It is fun to show them off and play with them lots. It is imperative to make sure to keep over stimulation to a minimum. Overhanding, over-stimulation can cause a puppy to become stressed and in turn can allow illness to kick in rapidly. Please ensure that puppy gets plenty of rest and nourishment. We suggest not letting an excessive amount of people handle your new baby in the first few days of transition. This is your most imperative bonding time. Smooth, stress free transitions are highly recommended. WE CURRENTLY FEED PURINA PUPPY CHOW. If it is not available in your area, we have other recommendations: Diamond Puppy, Blue Buffalo, Solid Gold Puppy; Nutro Ultra Holistic Puppy; Nature's Variety (all life stage food). It is important to understand that these are small dogs and puppies and will require frequent feeding when you first bring them home. You should "free" feed your puppy for the first two to three weeks; this means leaving food available to them at all times. It is wise to allow puppies to have access to dry food at all times until over a year old. Discuss appropriate feeding schedules with your Veternarian, as per puppy's/dog's age, weight, etc. Please give them a small portion of wet food with their dry food twice a day for the first week as well. This ensures that they are eating well and helps to prevent them from becoming stressed due to lack of enough food. We cook for our babies, a mixture of rice, chicken and vegetables. This helps to stimulate their appetite and provide a healthy, varied diet in addition to their dry food. Since they are used to eating certain food when they are with us, it is important that you provide them with a good canned food or small portions of canned tuna or chicken the first week during their transition. I also advise that you purchase a supplement called Nutri-Cal, or Pet-Cal. This is a high calorie supplement that helps to provide energy and prevent hypoglycemia from occuring in your puppy. If you do not have this supplement, pancake syrup can be used. Hypoglycemia is basically low blood sugar. This can occur when the puppy becomes stressed or is not eating properly. It is important to understand that they are very small and therefore, affected much more quickly than a larger animal. As they become older, their immune system will be fully developed and they will better be able to adapt to their environment. You will be able to wean them from free feeding to a feeding schedule that is more convenient for you as they get a little older and acclimated to their new home. TOXIC FOODS TO BE AWARE OF FOR DOGS (Small Breed Dogs): Grapes, Raisins, Onions, Chocolate, Cocoa, Macadamia Nuts, Avocados, Pork and foods containing the sweetener xylitol can also be fatal. Please do not give your puppy human food! They are not used to this and it could upset their digestive tract and cause problems. Yes, we cook for our babies, but it is prepared especially for them. It does not contain spices and seasoning that could cause upset stomachs. If you want to provide home cooked meals for them, please ask us when you pick your baby up and we will provide you with some recipes. As I stated before, you may change their diet, but give them a few weeks in their new home before doing so, to prevent any undue stress for them. Please be aware that puppies are like kids, they will put anything in their mouths and will attempt to eat most anything! This means you need to make sure there are no dangerous substances, such as household cleaning supplies, or small objects lying around that they can ingest. Puppy proof your house immediately upon bringing your new puppy home! Always, always provide fresh water for your puppy, especially if you have other pets. Many bacteria and infectious agents are spread through water, so make sure you are rinsing out your puppy's water dish and providing fresh water daily, and more often if the water gets dirty. However, I do not recommend washing out the bowl with soap, unless you make Very certain that no residue remains. Soap is obviously bad for your puppy, even in very minute amounts. I recommend using a stainless steel dish for your water, as they are more sanitary and easy to rinse out and clean lightly with a rag when needed. Playtime and exercise are very important for your puppy, but they should be given in moderation. Again, a puppy can become stressed when they expend to much of their energy at a time in play or being outside. Give your puppy frequent breaks, preferably in a crate or other quiet place where they can nap and rest after playtime and excerise. You absolutely should not leave your puppy outside while you are gone. Do not leave unattended in a yard or other area that is not proven to be safe. If you do this you are taking a big risk in many ways. I have had people who have had their puppies stolen from their back yards, or who have come home to find the puppy extremely ill, probably from something they ate or heat exhaustion or cold temperatures. If you have to leave your puppy unattended during the day while you are at work, or otherwise engaged, get a crate and X-Pen with food & water, as well as potty pads or other place to potty and a comfortable bed, for them to have a secure place where they have access to necessities without being left to their own devices or inclement situations. Keep in mind that our puppies/dogs are small breed. The sheer nature of small breed dogs is very different from larger breeds. Small breeds/teacups are more delicate than large dogs. They are more susceptible to heat and cold extremes. They can slip through very small openings. Always check your fence line regularly for possible weak spots, signs of digging on inside and outside of fence, foreign objects pushed up against a fence can make it easier for an agile dog to get up and over a fence. Small breeds are more susceptible to predators, including but not limited to: Coyotes, Hawks, Owls, Bigger Dogs, etc. Please heir on the side of caution. Remember to check for potential hazards regularly! Fences can get damaged or fall into disrepair. Things can change unexpectedly, so just use common sense to avoid any problem areas. Crating your dog can provide them with a safe place while you are away. You can also use a small room that is puppy proofed, such as the laundry room or a bathroom if you prefer. They will most likely cry and be upset by this at first, because it is new to them, and until now they have been with their mother and siblings nearly constantly. You and your family will have very different schedules than what we have had and what puppy is used to. Please keep in mind that changes take adjusting. Their are a few things that you should keep on hand at home to address any problems your puppy may have. As I stated in the beginning, prevention is the key! I have already discussed Nutri-Cal and its importance, so here I will cover some other items that you should have on hand in case the need arises. Most of this information is provided for a situation in which you have already taken your dog to the vet and are providing health care for them at your home. Most vets will not recommend keeping a puppy at the vet, because they are highly exposed to other sick dogs. A heating pad is important to have on hand in case your puppy does become ill. One of the highest priorities in treating a sick puppy is to keep it warm. This will often be the case if they become hypoglycemic, at which time their body cannot keep their temperature at an adequate level. If you take your puppy to the vet when they become ill, one of the first things they will tell you is to keep them warm, if they have you take them home. The next thing that is as important is to keep them hydrated. If they have diarrhea, they will quickly become dehydrated. If they are not drinking, then you will have to get a syringe and give them water, or preferably Pedialyte, as it has electrolytes that will hydrate them quicker than water. When you syringe your puppy liquid, do it slowly and carefully, as you do not want to choke them. Also, don't give them cold water, as this will not help their situation if they already have a low body temperature. Give them cool or room temperature water. You may need to syringe them a canned food with a little water or pedialyte mixed in as well if they are not eating. You should only do this if your puppy is ill or lethargic, not just because you think they need to eat. A puppy that is feeling fine will eat when they are hungry, as long as you are providing them with food. But when a puppy becomes hypoglycemic or ill, their appetite will diminish and they may lack the energy to eat themselves. I recommend you discuss this with your vet should they become ill.
As I stated earlier, keeping them hydrated is very important, especially if they have diarrhea. Stopping the diarrhea goes hand in hand with keeping them hydrated. That is to say, you cannot keep them hydrated if they have constant diarrhea. I use a product called Pet Pecticillin, also known as Kaolin Pectate. The specific dosage is given on the bottle, but what you will need to do is give this to them at the first sign of diarrhea and follow the prescribed dosage directions until their diarrhea has stopped. If you do this at the first sign of diarrhea, you most likely will prevent them from becoming ill! Diarrhea over an extended amount of time (more than a day or two) will cause your puppy to become dehydrated, hypoglycemic and lethargic! Coccidiosis is a parasitic infection of the intestinal tracts of animals, caused by coccidia, a protozoan. It is mostly spread from animal to animal through contact with infected feces. Most commonly infected are young animals, such as puppies, due to their lack of a fully developed immune system. Most adult dogs that are infected with this disease will show no symptoms, as their immune systems are fully developed and are able to withstand the presence of these protozoan parasites. Diarrhea is the main symptom, but if left untreated can cause severe illness possibly leading to death in young animals. I will provide a link to wikipedia that gives more information on the disease. This is a very common disease in puppies, and can easily be treated and sickness can be prevented. I recommend Primor, but there are other medicines available as well. If you see that your puppy has diarrhea, start them on the Pet Pecticillin and contact your vet for a prescription to treat coccidia. If, for some reason you cannot obtain a prescription from your vet, then there are other forms of the medication available online and at some pet stores or feed stores. I recommend that you call me if you need alternative medications.